Last year's SXSW numbers are staggering. All of them. But for performing bands and artists, this one's especially relevant: about 11,200 events, official or otherwise, were held in 2015. That's a lot of competition, huh? 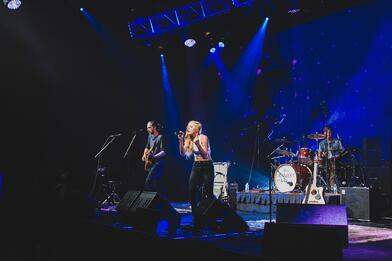 Even if you're a showcasing artist, you're still up against more than 2,200 other accepted acts. Those statistics beg the question: how will you stand out? Let's not forget there's a dizzying amount of non-musical attractions, brands promoting all over the place, and, of course, enough booze going around to overflow Lake Austin, either. Catching the attention of attendees – and keeping it – can be pretty difficult. We asked veteran and first-time SXSW artists how they plan to get noticed in what will likely be another overwhelmingly huge list of performers this year. The top eight tips are below – good luck! This should be everyone's starting point. For, like, everything ever. Honestly, though, if you aren't committed to your sound, if you don't stand behind your art, then why should anyone else? You know this. Just make sure you're really living it. According to Glen Dolfi of Qarabagh Ensemble, a group rooted in the traditional mugham folk of their country, Azerbaijan, an unfailing faith in their work is how they ended up on NPR's radar last year. "We believe in our music. It speaks, promotes, amazes. We plan to fearlessly jump into the festival and play our music as much as possible," says Dolfi. "It was our music which connected before the festival began, being selected for NPR's The Austin 100, the 100 artists 'worth discovering at this year's SXSW Music Festival... 2015's most thrilling discoveries.' We knew that our music was special. We believed in ourselves and the power of our music. But we were surprised by our selection. Who was NPR? We had no special promotion, no plan, no list of contacts to impress, no strategy for creating buzz. We just believed in our music and loved to perform and play for others – in the streets, at our housing, at gatherings we were invited [to]. We could feel that we were being heard, connecting, and it gave us energy to try harder to reach and touch everyone around us." Marketing and promoting are obviously helpful, but it's important that, first and foremost, you truly believe in what you're doing. "We focused on this 'magic,' as a video friend of ours calls it. It happens when you don't plan so much, but just allow the energy within to come out, to be in the music," he adds. Kydd Jones is a born-and-raised local, so he knows quite well how thoroughly the festival consumes Austin each year – and how hard it is as an artist to avoid getting lost in the mix. "I'll be releasing my new album, GR33D. It's always good to have something to promote at SXSW and let people know that you're an active musician," he says. "Have something upcoming in your pocket to show people as well, something big that you're getting ready to release after SXSW so people know you're not just a flash in the pan and could possibly be the next big thing that people at SXSW are trying to find out about." Showing up at SXSW with no music to offer besides a live set, of course, would be a missed opportunity. That's a given. But if you can't have multiple projects in the works like Jones, at least have a mental timeline prepared for anyone who asks. Jones was concerned about whether people would actually listen to free promotional CDs or not, and though he says flyers, posters, and business cards always help, he's opted for a decidedly more original method. "I've started giving out free tacos at my sets because it helps people remember me and creates brand recognition. People might not remember 'that Texas rapper who had some cool songs,' but they will definitely remember 'the rapper from Austin who gives us free tamales at SXSW every year,'" he says. It doesn't have to be food that you give away, obviously. Anything out of the ordinary, really, could help you stand out. You probably remembered to freshen up your press kit ahead of SXSW, but did you update it with the shortened attention span of overwhelmed industry folk at a chaotic festival in mind? As a rule, you should always be concise in your bio and press releases. Right now, though, brevity is extra crucial. For one, writers working on pre-show coverage have a massive pool of bands and artists to sort through. Make it easier for them to spot something that appeals to them by serving up the highlights in an obvious, efficient way. Qarabagh Ensemble hail from Azerbaijan, which Glen Dolfi notes piqued the interest of writers right away. "We came last year to SXSW from halfway around the world. 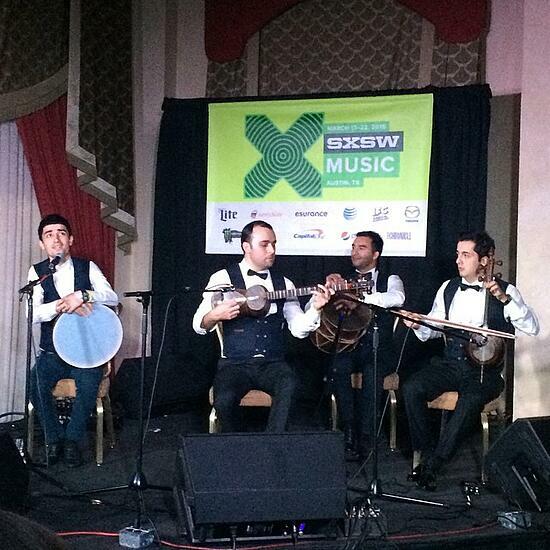 That gets attention, as in the Austin Chronicle's SXSW mission statement, 'Catch a band from a country you've never heard of (shout-out to the Qarabagh Ensemble from Azerbaijan).' Our first press," he says. If there's a unique, rare, funny or any more than run-of-the-mill angle to offer, consider placing it smack-dab in the spotlight. For a SXSW newcomer, Tangina Stone has her trip squared away pretty neatly. The Brooklyn artist, whose style is a seamless patchwork of soul, rock, pop, and R&B, names connecting with other artists as the crux of her plans. "I could not be more excited for the opportunity to share this music and chase the dream all the way to the stages in Austin. What I am most excited about for SXSW is not just that I am performing. I am excited to learn from the people who do what I do," she says. Stone aptly refers to it as "linking arms with fellow artists." "This industry requires teamwork, and so I am all about team building," she adds. That means inviting your musician and industry pals to your shows, as well as supporting them at their own as best you can. In the SXSW sea of strangers, the more friends you've got on your side, the better. Take note that Dolfi (and probably Stone too) is checking out bands to potentially connect with now, well ahead of the actual festival. Social media is one of the easiest ways to engage existing fans and gain new ones, but to really make the most of it, your methods shouldn't be wholly arbitrary. Each platform has its best uses – e.g., some are great for communicating directly with fans, others aren't. Grant Maloy-Smith, an American roots singer-songwriter based in South Kingston, RI, works with a publicist, but likes to handle his social media accounts himself. He's got 'em down pat in terms of how the each meet his individualized needs as an artist. "Facebook is nice for communicating with my friends and colleagues, while Twitter, Vine, and Instagram are great for reaching the general public – each in a slightly different way," he says. "With Twitter, I can potentially reach the most people (93,000), and Instagram is ideal for sharing concert posters and funny/interesting pics related to the show, to potentially 25,000 followers. Vine is ideal for little video clips that relate to the show. I usually use it when I get to town, and take little videos with my phone that might be interesting, and create some buzz about the event, or the city itself." Tangina Stone, on the other hand, makes regular use of messaging. "I am sliding into direct messages on all social networks daily," she says. "You may hear from me on IG, Facebook, or Twitter, but the bottom line is that you will hear from me! To keep everyone excited about my upcoming SXSW performance, I am also going to drop a surprise project that I have been working on all month. Look out for it, and when you see it say, 'Hey girl!'" What works for you will depend on your needs, so make sure you're regularly using the ones you've picked well in advance. Over time, you'll figure out your personal pros and cons, and will ultimately be better prepared to manage them all once you've entered the SXSW Thunderdome. If you've got the means to spend on a campaign, now is a great time to make that investment. Copenhagen post-punk tinged New Wave act the Foreign Resort has enlisted the help of an agent for this year's festival and the lead-up. The group couldn't afford a large-scale effort but managed to find an effective, cost-efficient middleground. "Besides a social media campaign, made up of tour stories supported by photos and a couple of videos (videos do not work as well as picture and text despite what Facebook tells you), we are currently planning a PR campaign with our PR agent – press as well as a radio campaign," says frontman Mikkel Borbjerg Jakobsen. He points out the unreliability of social media – that it's "too many people, making too much noise," and how easily it is for events to get overlooked. That doesn't mean it can't be useful, but Jakobsen doesn't recommend relying on that alone. "Since we operate on a super-tight budget, we can’t afford to do a nationwide campaign. Instead we are targeting selected blogs, magazines, and radio stations that focus on our genre, genres related to ours, or that we or our PR agent thinks would be a good fit," he explains. "We also look at where radio stations are located and try to get in-studio appearances and do interviews at college stations along our touring route. Since the Austin crowd is made up of people from all over the United States as well as the rest of the world, one cannot underestimate local buzz in each city. Who knows, you might have a bunch of Bostonians show up at your show. And it always makes your performance better to have an enthusiastic crowd dancing and cheering in front of the stage." This famously hyped festival is bound to intimidate newcomers, and that's totally understandable. There's a lot of factors to consider and tons of planning to do. The ever-present fear that if you don't get it all right, everything will have all been in vain, can be quite the burden. Don't forget, however, that most bands likely felt the same way their first time around. Imagine how much more daunting it is if you're coming from another country. Take a cue from Rosario, Argentina, band Sur-du-monde and make use of the greater community you're a part of. "It's our first experience [at] SXSW, so we are asking other bands and press agents to advise us about promotion. These days, we are making first contacts with record labels from the US that might be interested in our music so they help us promote and maybe distribute our material," says frontman Pablo Cravzov. Most people experience some stress about the festival, even returning bands. Whether it's issues with unforeseen transportation, lacking finances, or something small but soul-crushing, like a broken string and no backups, remember this: You are not alone in your freakout. And you shouldn't hesitate to reach out to other musicians when you need help. Seriously – this is the independent music world, after all. It's a community; even if you've never met the group that that played before yours, there's already some common ground to start on.